One of the north-central states of the American Union. A part of the Louisiana Purchase (1803), it was incorporated successively in the territories of Louisiana, Missouri, Michigan, and Wisconsin. In 1838 it was organized as the Iowa Territory, and in 1846 admitted to the Union. There are no records of Jewish organizations, charitable or congregational, prior to 1855. There were, however, Jews living in the river towns as early as 1847-48, especially at Dubuque and McGregor, the main shipping and crossing points for the West, and small unorganized Jewish communities existed at Davenport, Burlington, and Keokuk. From 1849 to 1879 the population shifted steadily toward the interior of the state and the Missouri River. Des Moines is the capital and the largest city of Iowa; it was settled in 1846, incorporated in 1851, and chartered as a city and made the capital of the state in 1857. Its population (1903) is about 70,000, of which, perhaps, 1,800 are Jews. The first congregation in Des Moines was the B'nai Yeshurun, organized in 1873, with conservative tendencies; its temple was dedicated in 1887, and ministered to by Rabbis Davidson, Freudenthal, Müller, Bottigheimer, and Sonneschein. It is now a Reform congregation. Three other congregations, the youngest of which was established in 1903, use the Orthodox ritual. Davenport, on the Mississippi, has (1903) a population of 40,000, including about 300 Jews. 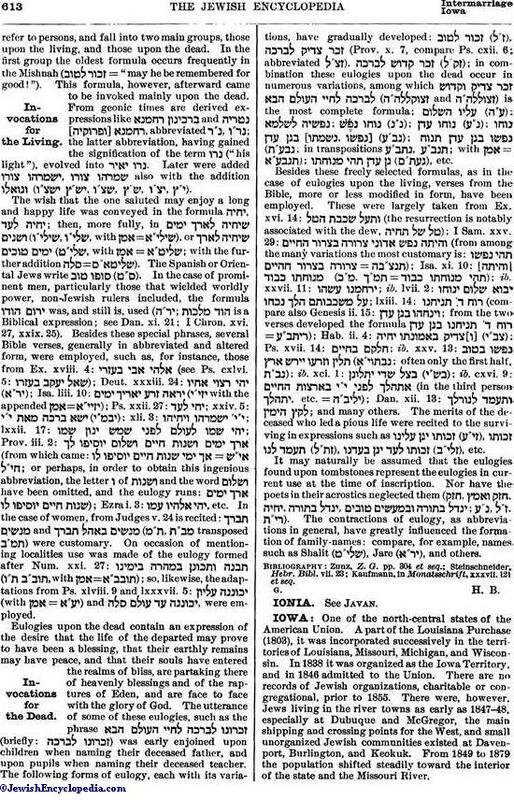 Its one congregation, B'nai Israel (Reform), was organized in 1861. The synagogue Temple Emanuel was dedicated in 1884. The pastorate has been held by Rabbis Freuder, Thorner, and Fineshriber. The community has a ladies' aid society, a burial-ground association, a B'nai B'rith lodge, and a branch of the Jewish Woman's Council. 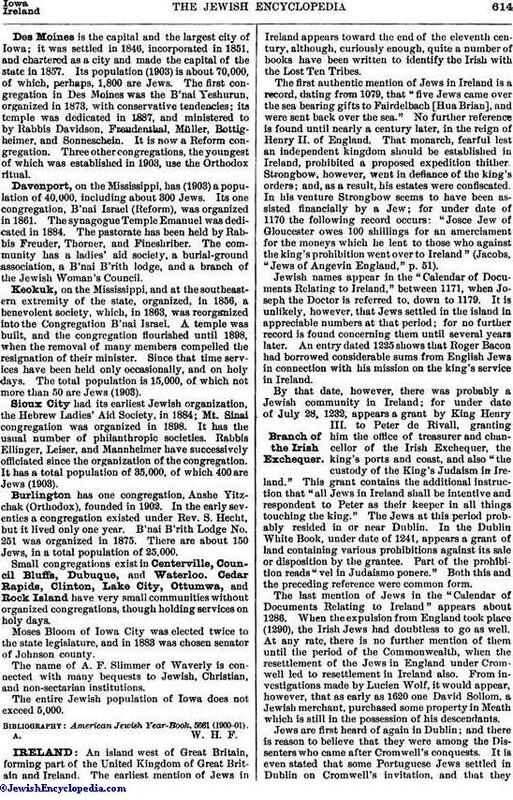 Keokuk, on the Mississippi, and at the southeastern extremity of the state, organized, in 1856, a benevolent society, which, in 1863, was reorganized into the Congregation B'nai Israel. A temple was built, and the congregation flourished until 1898, when the removal of many members compelled the resignation of their minister. Since that time services have been held only occasionally, and on holy days. The total population is 15,000, of which not more than 50 are Jews (1903). Sioux City had its earliest Jewish organization, the Hebrew Ladies' Aid Society, in 1884; Mt. Sinai congregation was organized in 1898. It has the usual number of philanthropic societies. Rabbis Ellinger, Leiser, and Mannheimer have successively officiated since the organization of the congregation. It has a total population of 35,000, of which 400 are Jews (1903). Burlington has one congregation, Anshe Yitzchak (Orthodox), founded in 1902. In the early seventies a congregation existed under Rev. S. Hecht, but it lived only one year. B'nai B'rith Lodge No. 251 was organized in 1875. There are about 150 Jews, in a total population of 25,000. Small congregations exist in Centerville, Council Bluffs, Dubuque, and Waterloo. Cedar Rapids, Clinton, Lake City, Ottumwa, and Rock Island have very small communities without organized congregations, though holding services on holy days. Moses Bloom of Iowa City was elected twice to the state legislature, and in 1883 was chosen senator of Johnson county. The name of A. F. Slimmer of Waverly is connected with many bequests to Jewish, Christian, and non-sectarian institutions. The entire Jewish population of Iowa does not exceed 5,000.